Volcano Watch: Why do some Hawaii earthquakes occur so far offshore? Seismologists call these events “flexural earthquakes” to reflect their cause (bending of the Pacific Plate). 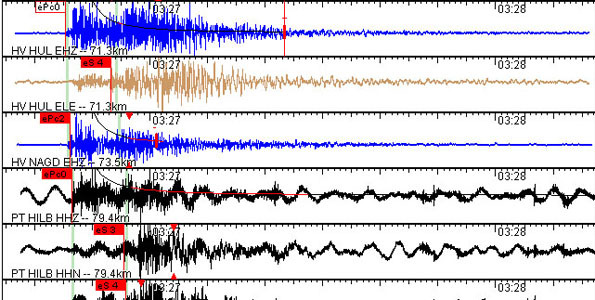 What causes these earthquakes, and how long will they last? October 15, 2015, is the 3rd annual Great Hawaii ShakeOut. That day also marks the 9th anniversary of Hawaii’s two most recent damaging earthquakes. We ttake time each November to recognize the anniversaries of two significant Hawaiian earthquakes that are both important to remember, even as we pore over new data. Volcano Watch: What’s Shaking Deep Under Hawaii? When magma moves underground, it stresses the rocks around it, creating earthquakes. Volcanic earthquakes usually do not exceed magnitude 5 in size. Volcano Watch: What happens when the earthquake “lights” go out? As we enter the 2012 holiday season, Kilauea Volcano’s continuing eruptions in Halema`uma`u at the summit and at Pu`u `O`o on the middle east rift zone keep providing the USGS Hawaiian Volcano Observatory with much to study and understand. Volcano Watch: Kilauea showing familiar patterns – or is it? Tuesday morning, July 31, beginning at 10:25 a.m., a number of text messages and emails were pushed out in rapid succession from the Earthquake Notification Service. The quakes flagged in those messages all occurred beneath Kilauea volcano’s south flank. Residents of Hawai`i are no strangers to earthquakes. Those of us on the Big Island, especially, are used to feeling several earthquakes every year. But did you feel the magnitude-5.5 earthquake on Memorial Day? Volcano Watch: The pool is filled—so is it time to light the barbecue? It seems that Kilauea has also been making plans about what to do as summer unofficially begins. This “planning” process has the staff of HVO watching with keen interest, especially during the last several months. Volcano Watch: Can earthquakes trigger volcanic eruptions? Seismologists are often asked the question, “Can large earthquakes trigger volcanic eruptions?” The short answer is yes, earthquakes and volcanic processes are closely linked.